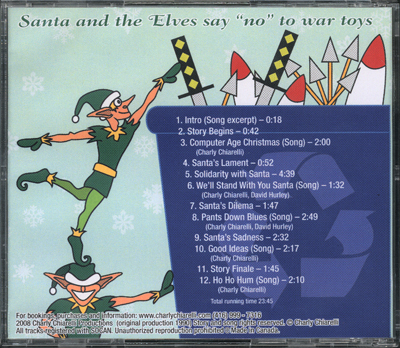 Santa and the Elves say "no" to war toys. A delightful Christmas Story for children and adults alike. Cu'Fu? (Pronounced Koo Foo) translates into Who Did It? A Sicilian's response to life's perplexing moments. Cu'Fu blends storytelling, acting and musical creativity in a way which leaves audiences spellbound. Cu'Fu is the first of Charly Chiarelli's triology for TV, which is followed by Mangiacake and Brutta Figura. Though Cu'Fu is an intensely personal story of cultural transplantation, it resonates with universal themes, making it a story for all times and all people. The scene of Charly getting his old Sicilian parents stoned on marijuana is exceptionally hilarious and profound. Charly's work transcends stereotypes. Charly's virtuoso harmonica playing ripples through elegantly interwoven scenes as he accompanies himself with a mosaic of original Anglo/Sicilian blues and haunting tunes from the old-country. Mangiacake is the second installment of the TV autobiographical trilogy that began with Cu'Fu and ends with Brutta Figura. All three were runaway hits - as both live performances and TV specials. Mangiacake picks up where Cu'Fu left off. As a young boy, he left burdened with the ultimate Sicilian name, "Calogero". When young Calogero decides that the road to success in Canada is assimilation, he accepts a name change to Charly. He chooses to become a "Mangiacake". Mangiacake (cake-eater) is what Italian immigrants call non-Italians, who eat pasty white sliced bread that looks like cake - to Italians. He goes to a "white-bread" high school outside the neighbourhood and does his best to blend in - with mixed results. Charly ends up running for president of his high school. His campaign slogan is "put a wop on top!". Charly's storytelling and harmonica playing is spellbinding. 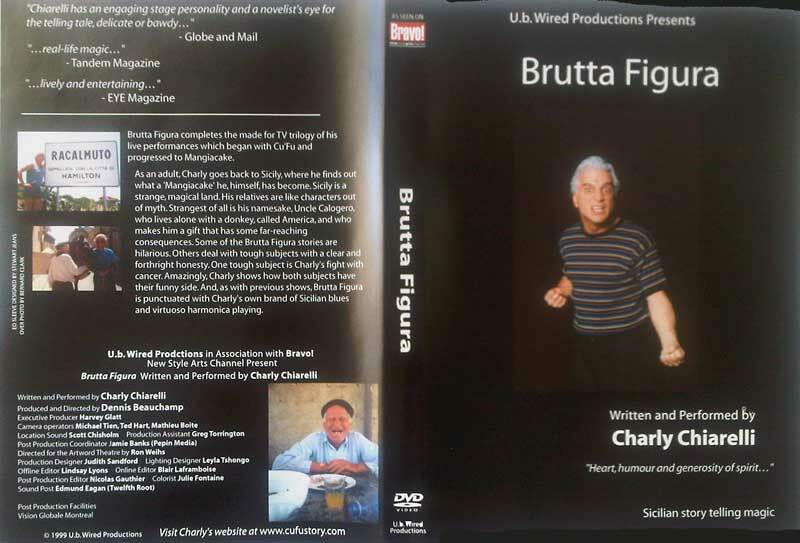 Brutta Figura completes the made for TV trilogy of his live performances which began with Cu'Fu and progressed to Mangiacake. As an adult, Charly goes back to Sicily, where he finds out what a "Mangiacake" he, himself, has become. Sicily is a strange, magical land.